In my last post, I've mentioned that my family and I soooo love mangoes. I guess now you'll believe that what I said is true...'coz I'm posting another mango recipe again! 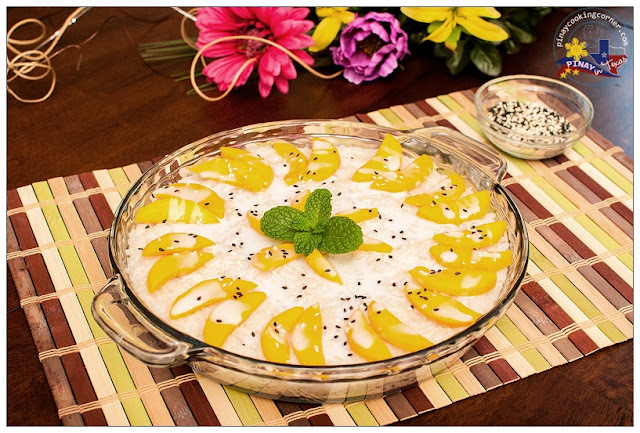 But truth be told, this classic Thai dessert that I am sharing with you today is one mango treat that only yours truly enjoy eating. The first time we tried this at a Thai restaurant, I fell in love with it. Unexpectedly, the hubs and my daughters didn't. They just took a small bite and ate banana roll with ice cream instead. 1. Wash glutinous rice three times then soak in water for at least 1 hour. Drain. Transfer to a pot or rice cooker. 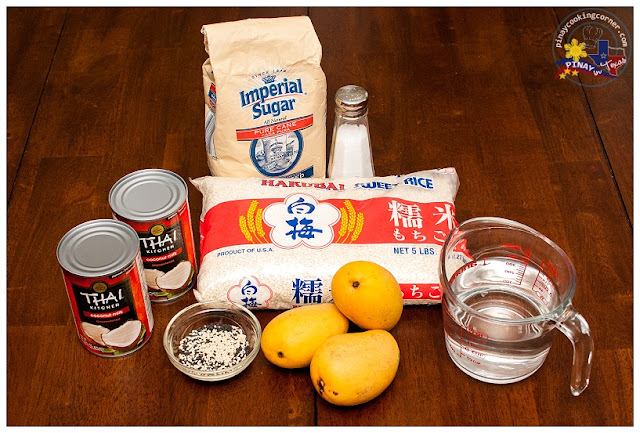 Add water and cook the same way you cook regular rice. Once cooked, transfer to a bowl and allow to cool down. 2. Mix coconut milk, sugar and salt in a saucepan over medium heat. Bring to a slow simmer while stirring constantly. When sugar and salt are dissolved, adjust heat to low and continue cooking with constant stirring for about 15 minutes. Remove from heat. Reserve about 1 cup and refrigerate until cool and slightly thickened. Add the cooked rice into the remaining coconut milk in the saucepan. Stir well with a spoon to make sure all the grains are well coated. 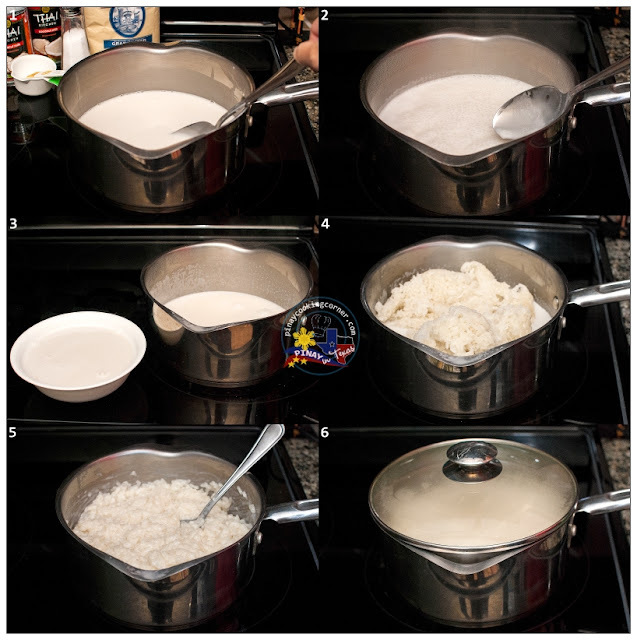 Let rice stand, covered, approximately 20 to 30 minutes, or until coconut milk is absorbed. 3. Just before serving, peel mangoes and then slice into desired thickness. 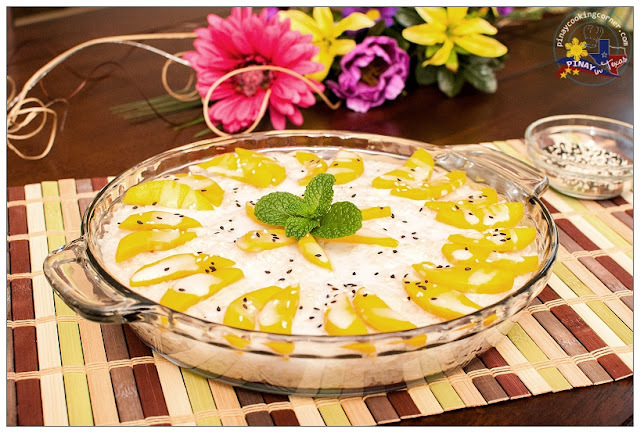 To serve, you can either do single servings by using ice cream scoop to put rice on individual dessert plates, or you can put all the rice in a baking dish or serving plate. Either way, just drizzle reserved coconut milk sauce over the rice and sprinkle with sesame seeds. 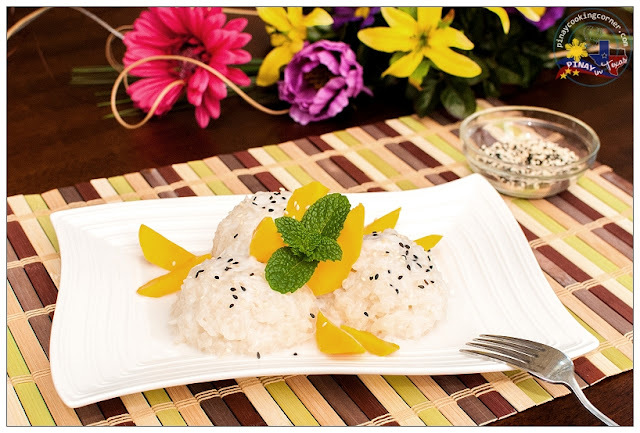 Arrange mango slices around the rice. Garnish with mint if desired. NOTE: This can be kept, covered at room temperature for 6 to 8 hours. Do not refrigerate or the rice will harden. If you want a thicker sauce, you can dissolve about 1 tsp rice flour or cornstarch into the reserved coconut milk sauce and then cook it over low heat for a few minutes until it thickens. Fingerlicking good dessert with amazing presentation. Tina, how well you have presented it. wanting to have a good scoop of it. Both of these things are my favourite...rice pudding and mangoes. Love this combo recipe.